"Hollie McNish is breaking boundaries and showing that poetry has a place and a role in the 21st century." aJames McMahon, CBS Tennessee Celebrate the rideaits joy, its labor, its freedom. In our world of fossil fuel dependence, insisting on the value and beauty of riding a bicycle is a subversive and necessary act. And, as any rider will tell you, the act is fun! Why I Ride is an ode to the experience of the rider that was collaboratively produced by the award winning lead poets of the UK arts collective, Page to Performance, and the Cambridge kids who participated in their summer 2013 workshops. Each stanza of the poem receives its own page spread and is accompanied by a bicycle-themed photo in either vibrant color or classic black and white. A video of Hollie McNish reading the poem over footage of Cambridge kids enjoying the ride is also available on YouTube. The book is a multimedia feast based around verse that any reader will find accessible and to which any rider will relate. A percentage of all profits from sales of the book will be donated to 350.org. 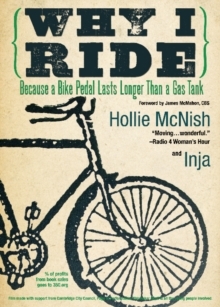 Why I Ride is a book for your body as much as your mindait eggs on the muscles, evokes the wind in your hair. "Why do you ride?/ And if you could but you don't/ Why not?" ___ HOLLIE is a UK poet who has released two poetry albums and one first written collection, Papers. She was 2009 UK poetry Slam Champion, coming 3rd in the World Poetry Slam Finals, behind the US and Canada, She has had over 2 million hits on youtube and was the first poet ever to record and perform at Abbey Road Studios, London. She was the 2013 Slambassadors judge, the UK's biggest youth poetry slam and has been running spoken word workshops for over 5 years. INJA is a professional emcee who has been leading lyric writing and recording workshops with young people, including N.E.E.T and hard to reach, for over 10 years.He works with hiphop, drum n bass, dubstep and grime and has toured all over the UK Europe and as far as China, Brazil and Colombia. He is the current host of the UK and World DMC's, the worlds biggest Dj-ing Championships.